Difference between revisions of "Grand Master's Royal Guard"
At the start of each quarter (January 1st, April 1st, July 1st, and October 1st) the Clusters of Fire earned by all Rank X (10), XI (11), and XII(12) members will be tallied. The top ten members (Restricted to Ranks X, XI, and XII) on the leaderboard will be the Guardsmen assigned to the Dark Councilors for the next quarter. Guardsmen will get to choose their Dark Councilor assignments in order of who earned the most CFs/CEs during the quarter. A special Trophy will be earned for the member who places first overall and the members who place in the remaining top 10 spots. At the start of each quarter (January 1st, April 1st, July 1st, and October 1st) the Clusters of Fire, Clusters of Earth, and placement in Fist-run gaming competitions earned by all Rank X (10), XI (11), and XII(12) members will be tallied. The top ten members (Restricted to Ranks X, XI, and XII) on the leaderboard will be the Guardsmen assigned to the Dark Councilors for the next quarter. Guardsmen will get to choose their Dark Councilor assignments in order of who earned the highest GMRG Score during the quarter. A special Trophy will be earned for the member who places first overall and the members who place in the remaining top 10 spots. At the end of the Quarter the process will repeat, and new Dark Council Guardsmen will be assigned, however past Guardsmen will get to keep their Dark Council Guardsman Accessories permanently. * Note: Dark Council Guardsman Accessories will be unique to each member who holds a Dark Council Position, if a new Councilor is appointed a new Accessory will be created by the Herald with the input of the new Councilor. The Grand Master's Royal Guard was a society formed by Lord Justinian Khyron shortly after an altercation with a rebel Clan known as Ar'Kell. 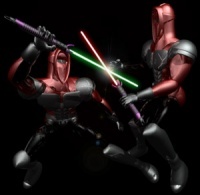 Khyron felt it was necessary to form an elite corps of bodyguards, in the same vein as Palpatine's Emperor's Royal Guard, to protect the Dark Council from devious plots and assassination attempts. The Guard served in this capacity under many different leaders, with many different concepts of protection, until the society was closed in 21 ABY by Grand Master Sarin. In 28 ABY Muz Ashen reinstated the Royal Guard under his new Fist of the Brotherhood. In 30 ABY the headquarters of the Guard was moved from the Shadow Academy, to The Spike on Antei. Following the destruction of Antei, Grand Master Pravus reformed the Guard in the vein of his vision for a New Order, taking cues more from the First Order’s Praetorian guardsman than Palpatine's elite. Under the influence of the former Grand Master known as "the Other", Clan Ar'kell staged a massive revolt in an attempt to overthrow the Dark Council. Their first attempt was to strike out at individual Council members. Fortunately, Ar'kell was driven back and fled to the Core to form their own splinter organization. It was their assassination attempts that led Khyronto form the Grand Master's Royal Guard. An elite sect of Dark Jedi soldiers, trained and conditioned to be peerless protectors of the reigning Dark Lord and his Council. Initial training was conducted under the supervision of Master Blazer, a loyal servant of the Brotherhood and a powerful warrior. As the Grand Masters Royal Guard progressed, the warriors leading the Guard became less capable and training began to become inefficient. The Royal Guard became more of a volunteer corps rather than an elite organization with wearing the famed armor becoming the only true motivation for hopeful Guardsman. When Grand Master Sarin saw the Guard's loyalty as questionable and realized the quality of training fading, he decided to put an end to the organization shortly before the Eighth Great Jedi War on Antei in 21 ABY. Many scholars believe that if the Royal Guard had not been absolved thatGrand Master Sarin would not have died needlessly in the sands of Antei during the Ninth Great Jedi War while fighting Jedi Master Omancor Crask in 24 ABY. Shortly after these events and his ascension to the Iron Throne, Grand Master Muz Ashen,recognized the need for a new Royal Guard. The Dark Lord, along with Headmaster Taigikori Aybara Dupar and the Grand Master’s Fist Ma`ar-Tyrius Ga-Tir, reinstated a brutal training ground on Lyspair so that the Royal Guard lived once again. In 28 ABY, Fremoc Pepoi took over the guard as Ma'ar stepped away, and within the year Fremoc moved the Guard to Antei at The Spike to be closer to the Dark Hall and the members it was protecting. In 32 ABY Valhavoc noticed that while members of the Royal Guard would aggressively climb through the ranks, upon reaching the top Echelon the motivation for additional growth seemed to dissipate. Working with Grand Master Pravus, he implemented a training system which challenged members of the top Rank to compete for the opportunity to guard a Dark Councilor, and commissioned rewards to be crafted by the Herald to be given to individuals who have earned this distinct privilege, by excelling beyond their peers in their martial combat prowess. When Valhvaoc resigned his position as Fist of the Brotherhood in 34 ABY, Pravus turned to one of his most promising pupils to rise to the role. Dracaryis was not only suddenly responsible for overseeing the Royal Guard, but also tasked with becoming the Supreme Commander of the Iron Navy and Legion. Guardsmen's training is broken down into the different Echelons. Upper Echelon Guardsmen assist with the training of the Lower Echelons. The Fist of the Brotherhood exclusively trains the upper Echelons because of their knowledge in combat and military tactics. Guardsman are taught several disciplines, but their focus is mainly on personal combat and protection of their assigned person. As the last line of defense for the Grand Master and his Dark Council, each member is expected to be a master of their craft, and train themselves physically and mentally every day. Lightsaber combat is featured predominantly over the other disciplines, and all training is conducted with live weaponry. Most guardsmen are also trained for special operations, assassinations, and other military tactics. It is not uncommon for Dark Councilors to go on their own covert missions, and require the services of their Guardsmen as more than frontline soldiers. As ambition drives the normal ranks of the Dark Brotherhood, it is also a valuable tool within the structure of the Grand Master's Royal Guard as well. Through sheer determination, a member may advance within the hierarchy of ranks within the Royal Guard. To do so, they need to earn Clusters of Fire, Clusters of Earth and eventually Pendants of Blood. Ranks within the Grand Master's Royal Guard are broken into four echelons and twelve ranks. As one advances within the Society, special features are unlocked: armor, weapons, robes, exclusive lightsaber hilts, and for the Fourth Echelon exclusive Accessories. First Echelon (Rank I through IV) - The initial rank of new Guardsmen, these low-ranking Guardsmen are placed into support positions and comprise squads assigned to higher ranking Guards. Second Echelon (Rank V through VII) - Having shown some skill and loyalty, these Guardsmen are trusted with more specialized training and may be tasked to serve as escorts for Dark Councilor's Magistrates. Third Echelon (Rank VIII through X) - Exceptional abilities separate these Guardsmen from the rest. Their distinction and service is seen with the presence of Praetors and Tribunes. Fourth Echelon (Rank XI and XII) - Paragons of skill, dedication, and effort. These nine Guardsmen demonstrate the highest levels of combat readiness and situational awareness. It is these exemplary warriors that are trusted to guard the Grand Master and the Main Body Dark Council. The Grand Master’s Royal Guard are made up of seven specially trained Guardsman that are hand-chosen by each sitting Grand Master. 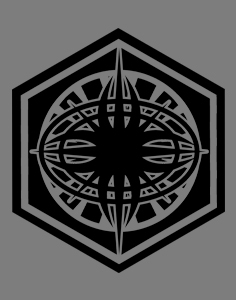 They are permanently stationed in the Throne Room in the Dark Asecent of Arx, but also accompany the Grand Master when traveling across the Brotherhood’s homeworld. These seven Guardsman remain in their positions for as long as they are able to serve efficiently to the Grand Master’s purview. Clad in black and white plated Praetorian Armor, the seven Guardsman are trained to combat both Force Users and mundane enemies, eschewing ranged weaponry in favor of melee weaponry. Members of the Dark Brotherhood have long participated in contests of skill and prowess to earn an honorary selection to the Grand Master’s Royal Guard. At the start of each quarter of a given galactic standard year, the top ten members of the Grand Master’s Royal Guard are able to select a member of the Dark Council they wish to serve. While it is possible for members that earn these positions to act as Guardsman to their Councilor of choice, the role is largely considered ceremonial for the sake of prestige. At the start of each quarter (January 1st, April 1st, July 1st, and October 1st) the Clusters of Fire, Clusters of Earth, and placement in Fist-run gaming competitions earned by all Rank X (10), XI (11), and XII(12) members will be tallied. The top ten members (Restricted to Ranks X, XI, and XII) on the leaderboard will be the Guardsmen assigned to the Dark Councilors for the next quarter. Guardsmen will get to choose their Dark Councilor assignments in order of who earned the highest GMRG Score during the quarter. A special Trophy will be earned for the member who places first overall and the members who place in the remaining top 10 spots. At the end of the Quarter the process will repeat, and new Dark Council Guardsmen will be assigned, however past Guardsmen will get to keep their Dark Council Guardsman Accessories permanently. Note: Guardsmen will be assigned the Accessory of the Dark Councilor who is holding the position at the time of selection. If a new Councilor is appointed their Accessory will be awarded at the start of the next quarter. Members will not be awarded two Dark Councilor Accessories in one quarter. Note: Dark Council Guardsman Accessories will be unique to each member who holds a Dark Council Position, if a new Councilor is appointed a new Accessory will be created by the Herald with the input of the new Councilor. Guardsmen are assigned to the position, not to the person. Per standard operating procedures Guardsmen will wear their Royal Guard armor whenever on assignment to their Councilor. In order to keep the Guardsman in top fighting condition the Fist of the Brotherhood has seen to it that there are regularly scheduled wargames. These serve not only to hone Guardsman's abilities, but also give individuals a goal to strive for and bragging rights to their peers. Gorefest is a competition that is held at the end of every month for GMRG members only. It is a brutal test of member's skills and endurance with gaming. At the end of the weekend, who ever has the best PVP Score (defined as Matches Won * Matches Won/Matches Played) earns a top level crescent. For a currest Roster showing all members of the Grand Master's Royal Guard and their Ranks refer to the GMRG Society Roster. Throughout its many years of service, the Grand Master's Royal Guard saw the appointment of many Commanders. Though some names have been lost to time, below serves as a list of the former Commander's of the Guard, in order of most recent to earliest.